The Sanctuary: Endangered Species* is a worker placement euro style game aimed at more experienced gamers (the 10+ on the box would be fine for children who regularly play post-gateway games). The 30-60 minutes listed on the box is though, in my experience, far less accurate. Even with two the game will probably go at least an hour, while with more you could easily be looking at two-plus. While at its heart this is a cube-pushing euro game, the original theme (setting up your own animal sanctuary) does enough to make it stand out from the competition; but don’t expect to ‘feel’ the theme – unless you can work with ‘blue animal picture on cardboard chit eats blue wooden cubes’. That said, it has certainly helped everyone I’ve played with get engaged with the game when we’ve sat down at the table. In terms of components, it’s a mixed bag. There’s certainly nothing game-breaking here, but they made some pretty strange choices. Some of the cardboard chits are only printed on one side, for example – despite others on the same punch board being double sided. And some of the flat cardboard pieces are as small as 8x10mm – the smallest (and least practical) I’ve seen in a long time. However, overall it gets a pass. The artwork is OK throughout (the box cover is stunning) and the graphic design, once you get the hang of it, is surprisingly effective. It pretty much has its own language, but once you get it everything falls into place really well. All in all, it’s worth the 40 euro price tag – a relative big-box bargain in the current gaming climate (however, see ‘key observations’ below). 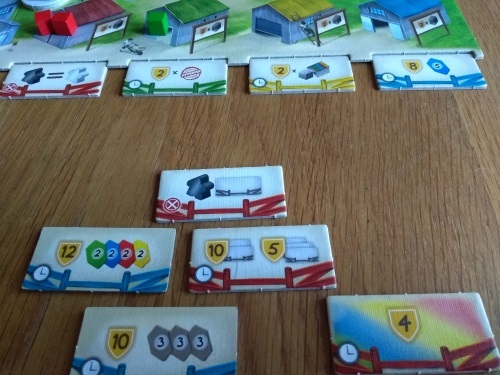 Much of The Sanctuary euro gamers will be well familiar with, so it’s worth starting with the basics before moving onto the more original ideas: each round you take it in turns to place your two workers, who will in turn give you actions. At the end of the game, players earn victory points for their collection of animals (and how happy they are); land they reclaim; resources they accumulate, and storehouse improvements (end game scoring bonuses or special abilities). And yes, you guessed it – all those things are done by taking simple actions with those workers. Instead of a board, the actions are on five different coloured card types. These are prepared as 10, 16 or 20-card stacks at the start of the game (to ensure a relatively even spread), depending on player count, and a line of these cards is shuffled and laid out in a line at the start of each round (there will be five or six rounds, depending on player count). It’s a bit fiddly at setup, but has the desired effect. Each card has a primary and secondary action. You do the primary action of the cards you place your workers on – but also the secondary actions of any cards your workers can ‘see’. This is all other cards, in both directions, until you come across one that has a fence printed on, or another worker on it (there is even a special ability that lets you wrap this sight around from one end of the card line to the other). The player who lays a worker first also places last (Catan style), which evens out over the game, but your choice is always interesting: do you go for a very specific action you really need, or pop yourself into space in the hope of getting lots of sub optimal actions? You’re never allowed to be fully boxed in, so will always have the potential for at least two actions per worker – but some secondary sections are blank, while others may be of no use to you. Each player can have up to four types of animal in their sanctuary, and making them happy is key: end game points are happiness multiplied by quantity (the latter of which is capped at six per animal type). And there’s an action for everything: take animal, raise happiness, gain resources, discard them to take more animals etc. Will you concentrate on one animal type, spread the love, or go off piste and concentrate more on resources and habitat? You can clear land, increase its value, then flood or forest it. But whatever you do, don’t let your opponents easily get the actions they most need. The writer: A nice extra quirk of The Sanctuary are threat tokens. You pick one of these up when you do a particularly strong main action, so they’re totally avoidable – but if you take them, you’ll lose points at the end of the game for each you have (and they can quickly mount up). It’s a nice extra mechanism for those who like a gamble, or who feel they can out-point the negatives with these stronger options. It’s a small level of extra complication to the rules that some publishers would remove for the sake of simplification, but that actually adds a very interesting extra level of decision making. The thinker: If you’re playing with thoughtful players, believe me, this one can go long – but it is at least a largely satisfying experience. While I have no problem with tactical blocking, there can be a bit of an issue in luck of the draw after about half way; once you’ve decided on a strategy, but the cards simply don’t fall your way – you can certainly feel a lack of control. This wouldn’t be a problem if the game was as long as advertised, but for those inclined to think through their decisions this can become frustrating. But it is fun, as long as you understand that this is at the tactical end of the worker placement game scale. The trasher: I always like a game that adds a different feel to player interactivity, and The Sanctuary does just that. Your worker placement has to take other players into consideration as you need to think about where other players will place their workers – and that doesn’t mean thinking negatively against others. You may like he look of a spot, but if someone else really wants the spot next to it then you’re going to have limited actions too. It can really make things drag, especially as you can’t plan ahead, but it’s pretty delicious so is fine with me! The dabbler: While the theme is pretty much pasted on, it’s still done really well. 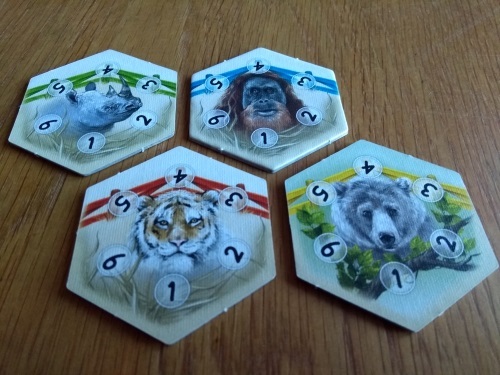 Each player will take four coloured discs to represent the animal types they bring into their sanctuary, but each is double sided and has two unique endangered species depicted on it. Each is named in the rulebook, so you can do a bit of research if you like, and it means players that want to can choose the animals they want in their sanctuary. It would’ve been even better if there had been a PD Verlag-style extra booklet with animal info, but it’s a strong nod to theme nonetheless – it would’ve been easy to have four generic animals repeated. While I thought The Sanctuary just about got away with it in terms of components, it is one of the game’s biggest issues in terms of player comment. While I do understand these misgivings, I’m surprised at complaints of the €40 price tag. In reality, it seems distribution is the problem: the real issue is the total price paid when you include shipping it out of Poland. Hopefully the game will get a distribution deal with someone in the states, at the very least. It certainly deserves it on gameplay. Another issue is comparing it to the ‘average’ new release – which, to me, are largely a total waste of plastic destined for landfill and the slow death of our planet. I know I’m in the minority, but I’d rather pay under £50 for a less flashy version but really good game than three times as much for a metric tonne of plastic crap I grew out of at 15 hiding yet another average generic fantasy/sci-fi game. Onto genuine issues, the chaotic/random nature of the worker placement – while original – certainly doesn’t appeal to everyone. As already mentioned, this is very much a tactical euro. A related issue is the threat token to ranger action ratio. In a two or three-player game there will only be one ranger card in the whole game – and it is the only guaranteed way to get rid of threat tokens. It is very easy to use the ranger once you get one, so if you get pushed out of the option it pretty much closes a route to you completely – which seems like a design oversight. But possibly the biggest problem is how dominant the ‘single animal’ strategy feels: only take one animal type and put all your efforts into maxing out its victory points. Stopping this relies on others stopping it, but even then I’ve seen a player doing this win each game we’ve played so far. It doesn’t dampen my enthusiasm for The Sanctuary yet, but if – with experience – I still can’t make another strategy win after some more plays, I’ll revisit this review and mark it down some. Maybe it’s me, but I’ve seen a trend in recent years for games that initially seem deep but, once you’ve played them a few times, show themselves to be little more than having several roads to victory without enough interaction to make them interesting over multiple plays. From my experience so far, The Sanctuary bucks this trend. While many of the mechanisms can be palmed off as ‘standard euro’, the worker placement element is a real breathe of fresh air – and one great mechanism is all a game needs to stand out. While the amount you need to think about most decisions can really induce the dreaded AP – especially as you can’t really make a choice until it is your turn – it’s precisely this that makes it outstanding. No, it won’t be for everyone. But if you love pitting your wits against like-minded thinky opponents and don’t care if a game goes a little long to make that happen, I can’t recommend The Sanctuary highly enough. * I would like to thank Cube Factory of Ideas for providing a copy for review.